450 CRF 2013 template update with old and new parts and spec map change. Included 2013 Honda Muscle Milk and a black edition. 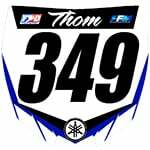 Re: 450CRF 2013 Template Update!! Thanks put it to good use! Sorry i forgot in the .psd file the spec map is for Honda Muscle Milk graphic kit, this link is the good spec map. I've always wondered : what a spec map is used for? Yeah, I knew that, already made researchs . It's just that, in the upcoming model thread, sometimes guys talk about the model being too much or not enought shiny. To be more precise I was wondering why using 2 things for what it looks like (from beginner's eyes) to be the same goal? Time to crack open the Photoshop, Great Job! No it doesn't working.. I cant see any of mine selfmade bikes in CRF450 2013. Do i have to SAF them?